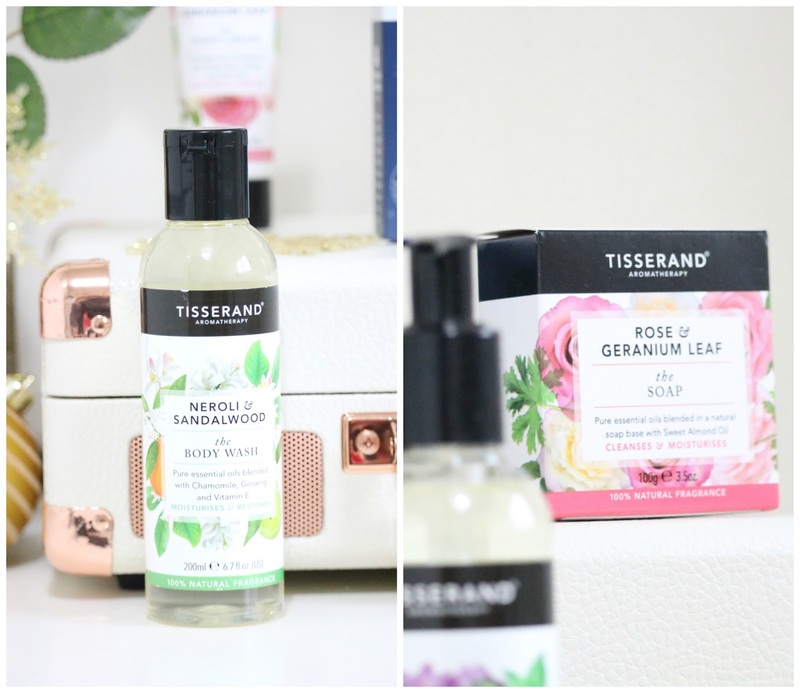 Tisserand has been one of my favourite brands this year and last year too when I was first introduced to them; I'm always using the bath oils as they are so indulgent and even though they aren't as interesting as bath bombs, they are much more moisturising! Tisserand have just released a new bath and body collection, all of which looks heavenly and perfect for Christmas. Lavender is one of my favourite scents, for anything, as it's so incredibly relaxing and calming to me! So anything that contains lavender and I'm all over it; this lovely hand wash also contains white mint, aloe vera, comfrey and chamomile. The hand wash smells heavenly, it's a gorgeous lavender scent but I don't really get any mint but that's fine with me as the more lavender the better. It lathers well, doesn't strip the skin and it doesn't irritate my eczema which some hand washes can do. Geranium is another favourite of mine, well I'm a fan of anything floral really and again this is another Tisserand product that smells divine - all of them do! The soap contains almond oil and pure essential oils to cleanse and also moisturise. It has Tisserand embossed on the front and it smells subtle but gorgeous. I think any of these products would make perfect additions to a present hamper or as a stocking filler. I love any products that contain lavender and also products that are supposed to help you sleep (even though most don't really work but these definitely help) as I'll try anything and they usually smell comforting and calming. This set contains the Sweet Dreams Bath Oil, Sweet Dreams Rollerball and the Sweet Dreams Body Oil, all of which are mini sizes so they'd be great as trial sizes for people who haven't tried the brand before and for those who travel. I have the full size of the Sweet Dreams Bath Oil (30ml) which is just heavenly and the Sweet Dreams Bath Oil (30ml) that contains jojoba seed oil, lavender, jasmine flower oil, bergamot peel oil and so many more lovely, natural ingredients. Unlike most body oils I've tried, this one absorbs really quickly and it leaves the skin smooth, moisturised and subtly scented - my only negative is that I wish the scent lasted longer on the skin although that's where the Sweet Dreams Rollerball comes in. The Sweet Dreams Rollerball has the same gorgeous scent but in a quick and portable format that's perfect to use on the pulse points before bed and on the go but again I wish the scent was a little stronger/longer lasting. 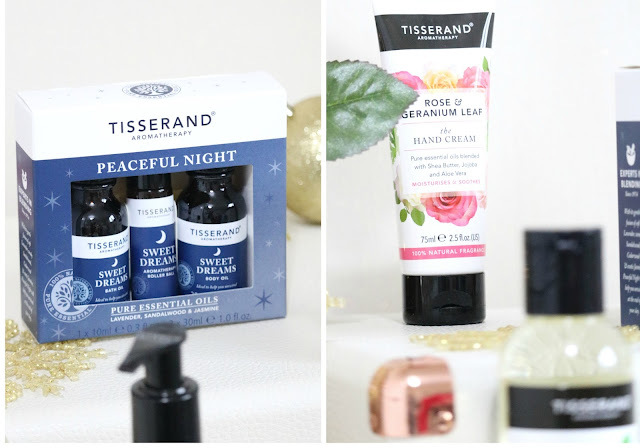 You can't go wrong with anything from Tisserand as not only are the products natural and effective but they all smell heavenly and this is no exception. When I look for certain scents in perfumes or products, lavender, neroli and sandalwood are all options I look out for. It also contains chamomile, ginseng and vitamin E. The scent is floral and musky, it's a perfect autumn/winter scent and it makes me feel relaxed every time I use it! As with the hand wash, it leathers well but it doesn't dry out the skin or irritate. There are quite a few products in this Rose & Geranium scent range including this gorgeous hand cream. I use hand cream multiple times per day as I have dry skin anyway but I also have eczema on my hands *cries* and hand creams definitely help to keep my hands feeling comfortable. The hand cream contains shea butter, jojoba and aloe vera to moisturise, smooth and soothe the skin. 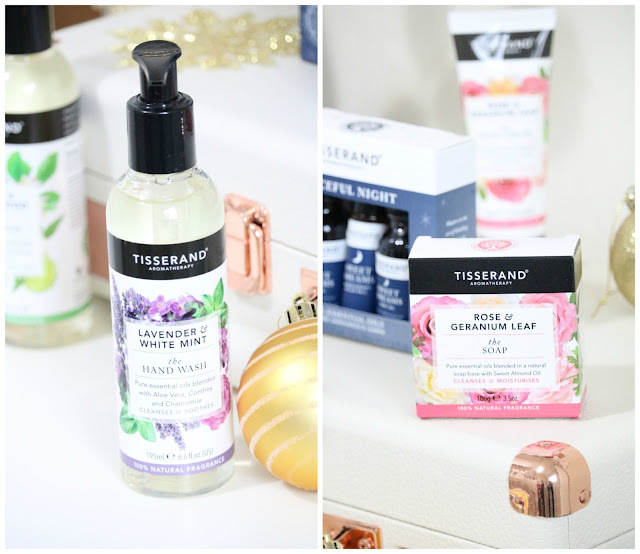 Overall, I'm so happy with all of the products I've been able to try from Tisserand and I couldn't recommend them enough either for yourself or as a Christmas gift. None of the products irritate my sensitive, eczema prone skin and they all smell wonderful - they're presented beautifully too. Overall rating: ★★★★★, 5/5! Have you tried anything from Tisserand? What do you think of these gift ideas? Everything here looks so lovely! I really like the look of the night set! I haven't heard of this brand but everything looks so good and the packaging is so pretty I might have to give them a try out! Haven't tried anything from them since they are most probably not available in our country, but they look promising! The packaging of these are ever so pretty! The sweet dreams set would be so lovely for someone who struggles getting some shuteye! I love the packing of these, they are so sweet! I really like the essential oils for sleep- they would be a lovely gift. Very nice post. That hand cream sounds lovely! All of these products sound so relaxing and peaceful, love the packaging too. Adding peaceful night to my list!